Welcome to Simpsons Mobile Automotive Repair. 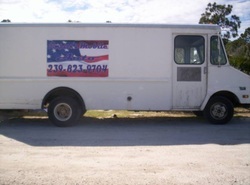 Our very own Navy veteran Troy Simpson is an experienced mobile mechanic offering inexpensive car repair to Lee County residents and the surrounding areas at their convenience. As a mobile mechanic we come to your house, office, the beach or if your stranded roadside- in coordination with your schedule . As a Navy Vet you can count on Troys "Discipline, follow through, and meticulous attention to detail" ” --and getting the job done right the first time. "If you've got a problem with your car, then I'm your solution. No more towing bills.... Just call me!!" "I'm there for your convenience, at home, place of business, or if you're stuck en-route." What this really means to you is that, your time can be spent doing the important things in your life instead of wasting it by bringing your car or truck to a service facility and also by saving money on towing and maintenance costs. I specialize in mobile service and have great year round savings. With 20 years experience, most makes / models car or truck. I also have worked with Swamp/Hunting Buggies. Yes, everything from engine diagnostics, tune-ups, engine removal and replacement, oil changes, transmission services, timing chain or belt replacement, carburetor, brakes, suspension, heating and air conditioning and electrical. YOU NAME IT... WE'LL FIX IT !! THANKS AGAIN FOR USING SIMPSONS--GIVE US A CALL- $AVE TODAY!